The facade blends Beaux Arts and Renaissance Revival architectural styles--an eclectic mix of Spanish Revival, Italianate, Palladian, and Classical Revival. Walk inside and a life-sized Carrara marble statue of Thomas Jefferson, created by famed sculptor Edward V. Valentine, stands in the lobby, flanked by faux marble columns, a Tiffany stained-glass skylight, and a grand staircase rumored to have been the inspiration for the staircase in Gone With the Wind. Fish and alligators once swam in the ponds in Palm Court, but today’s hotel does not rely on the unusual to attract its clientele. Each of the 181 newly constructed guestrooms and suites features a luxurious marble bath with soaking tub. The rooms have a residential feel with luxurious linens and furnishings, alongside conveniences like a dressing area and a Nespresso coffee maker. 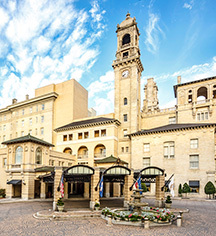 A full-service health club with indoor pool is on-site, and the Jefferson Hotel also boasts one of Richmond’s finest restaurants, Lemaire. The list of celebrities and notable guests that have visited here is extensive, including 13 U.S. Presidents. But guests need not be political or Hollywood royalty to enjoy all that this iconic Richmond landmark has to offer. 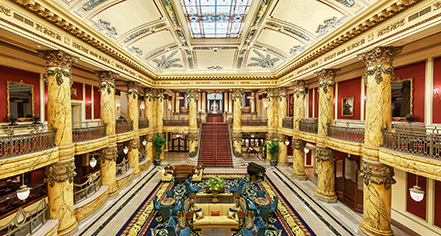 The Jefferson Hotel, a member of Historic Hotels Worldwide since 1989, dates back to 1895. Alligators lived in marble ponds surrounding the Thomas Jefferson statue in the Palm Court lobby until 1948. Deposit: Credit card deposit required upon check-in. Hotel/Resort Fees & Taxes: All reservations may be subject to a City/State Tax of 13.3%. Occupancy Restrictions: Varies by room type. The largest unit available on-property can accommodate four (4) people. Parking: Self-parking: Available; $12 per night. Valet parking: Available; $20 per night. Payment: Payment is required at time of booking. Visa, MasterCard, and Amex are accepted. Pet Policy: Service animals allowed: Yes. Pets allowed: Yes. Restrictions: Dog-Friendly. Services; Pet-sitting. Fee: $50 per pet, per day. Rollaways: Available upon request; $60 per night. Shuttle Service: Free local shuttle; advance reservations required. Transportation: Limousine service can be arranged by contacting the concierge. Complimentary transportation is available from the Amtrak Main Street Station in downtown Richmond. Advance reservations are not required for this service. When Charles Dana Gibson and Irene Langhorne--better known as the Gibson Girl--hosted their engagement party on Halloween 1895, little did they know that their nuptial celebration would be the first in a long legacy of events at Richmond’s most revered hotel, The Jefferson. Learn more about the History of The Jefferson Hotel .